Spreading joy and content--it's the New Order way. Agent Yucie Van Burean enjoys the social aspect of EVE. She loves meeting people and making new friends. One way to break the ice is to gank; another is to bump. Yucie also employs another common method to greet unfamiliar faces: She places the mark of 315 on them. 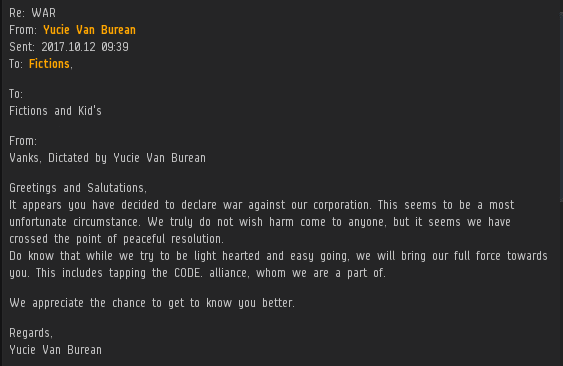 Yucie placed a bounty of 315,315 isk on Fictions, a stranger whom she judged to be a highsec carebear. Fictions didn't like it. Not one bit. Yucie was taken aback by Fictions' extreme reaction. After all, it was just a friendly bounty. She politely informed the 2006 character that bounties cannot be retracted. And she made it perfectly clear that she was not intimidated by the threat of war. Our Agents love to shoot ships that can shoot back. Fictions and Yucie both belonged to small corporations. 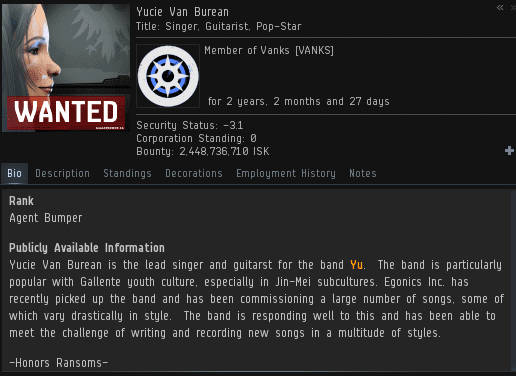 Yucie was a member of Vanks; Fictions' corp was called Kid's. Despite Yucie's admirable attempt at diplomacy, the two corps were sliding toward war. Fictions ratcheted up his rhetoric from "hostile" to "EULA-bending". The die was cast. Fictions declared war on Yucie's corp.
As I said earlier, Yucie enjoys spreading fun. Wardecs often provide opportunities for spreading fun and content to a large number of people. Yucie cautioned Fictions that her friendship with the mighty CODE. alliance meant that the conflict was likely to spread. Fictions was aware of the CODE. issue. He resolved to go on the offensive and declare war against CODE., too. Perhaps Fictions realized that CODE. primarily consists of gankers, not wardeccers. What the carebear didn't count on was the fact that Yucie was also on friendly terms with The Marmite Collective, whose specialty is engaging in highsec wardecs. And within minutes, the Marmites chose to join the war as Yucie's ally. To put it mildly, Fictions was displeased to learn that he'd unintentionally gotten his corporation involved in a war with the Marmites. 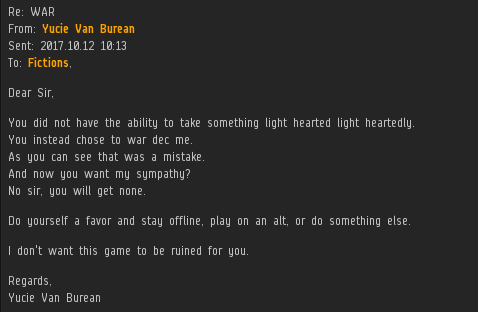 Apparently the carebear never considered that CCP's pro-defender wardec mechanics might backfire on him. Fictions had gone from hawk to dove in record time. Yucie observed that this miner was one of the most pathetic she'd seen. Still, things could get worse for Fictions. A lot worse. Our Agents are known for having an extraordinary capacity for compassion, and Yucie is no exception. She'd already tried to warn the carebear against hurting himself, but he hadn't listened. Now she had to warn him again. If he persisted, Fictions could find himself walking down a very dark path indeed. wow just wow. do I even need to say it? How can we forget your best agent. BTW You guys are so sensitive you deleted the spam guy, whats wrong get defeated again by words? Reading Fictions eve mail makes my brain hurt. Just happy to see things aren't going his way after he decided to start a war. I’ve been at war with the Marmites. Twice. It doesn’t take a lot of your time. The bounty tactic is certainly effective as a hand-shake; you know, just to let them know they're on notice.. I was in some backwater once, full of would-be miners. While I chatted amiably to them in Local, I decided to add a 315,315 to every character in the list. It went down very well in terms of livening things up, I can tell you. Slapping a big red 'Wanted' banner across those lovingly created (but truly ghastly) avatars seemed to be an effective means of grabbing their attention. If you think about it, there are only a few ways in which you can actually affect things in EVE. For me, it's bounty, bump, gank. All are perfectly legitimate ways to spread the good word of the Code. That miner needs moar bounty!!! I have met Yucie and found her intelligent,funny,friendly, and a real asset to the EVE universe.It does make me realize that while the CODE agents are professional, they are faced with dealing with immature and emotionally stunted people. While I don't financially support CODE ( like they need it), they do have my full support in game to continue their crusade. What does "my full support" entail? Just a cheer leader on the sidelines? Yea, get a permit or get rekt. Yet another example of Jamey and his CHODE. slaves driving individuals away from Eve Online with their antagonistic tactics. Eve is dying, and CHODE. is a primary contributor. Wow. He should have put a bounty on himself or ask someone else to do it instead of WARDECing someone out of rage-stupidity. Are New Order Agents Bullies?